If you’re one of the 200,000 new patients diagnosed with sleep apnea in the past year, you will require treatment. The complications of untreated sleep apnea extend far beyond chronic snoring, morning headaches, and daytime fatigue. When left untreated, you increase your risk for developing serious health complications, such as an increased risk for stroke and heart disease. Not to mention, your quality of life is greatly reduced as your cognitive abilities and mental health begin to decline. Thankfully, you’re able to treat sleep apnea using the EMA appliance. Feigenbaum Dental offers the sleep apnea oral device in Creve Coeur to sleep soundly at night while protecting your overall health. What is the EMA Appliance? For those who suffer from chronic snoring and obstructive sleep apnea, the EMA (Elastic Mandibular Appliance) has shown to be effective for keeping the airways open. Treatment using this oral appliance involves creating a customized removable appliance that’s worn at night. The device works by advancing the mandible to open the bite. This helps keep the airways open to allow for adequate airflow while sleeping. As a result, you’ll sleep soundly while reducing snoring and the symptoms and complications of sleep apnea. The device offers many customizations, such as 9 different strap lengths and 4 options for elastic tension. Unlike other oral appliances, the EMA appliance won’t restrict your lateral or protrusive movements due to the elastic bands to increase your comfort. Many have come to prefer this oral appliance because it doesn’t interrupt breathing through the mouth—perfect for those who suffer from nasal congestion. The benefits of the device come from the unique innovations it offers to position the mandibular while allowing for free movement. With the use of the elastic bands, the device is easily customizable to correctly move the mandible forward while allowing the jaw to freely move in all directions. As a result, the repositioning keeps the airflow through the oral pharynx open to reduce snoring and the restriction of airflow. 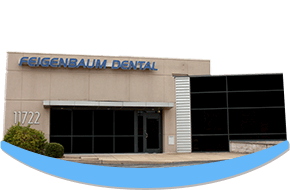 For more than 30 years, Feigenbaum Dental has been providing comprehensive dental services and sleep apnea treatment in the St. Louis area. Our commitment to our patients drives us to provide complete care using the most advanced and proven methods of treatment. By offering the sleep apnea oral device in Creve Coeur, we are able to treat apnea using a noninvasive method. This form of treatment in the preferred option for those who don’t want surgical intervention or the discomfort of using other therapies, such as a CPAP machine. After an evaluation for sleep apnea, we will create your custom EMA appliance to coincide with your individualized treatment plan. We will inform you of your options and how to properly use the device to regain control over your sleep quality and overall health. If you’re suffering from obstructive sleep apnea or chronic snoring, let us help you improve your quality of life and overall health. Call our office today at (314) 596-9617 to schedule a consultation.